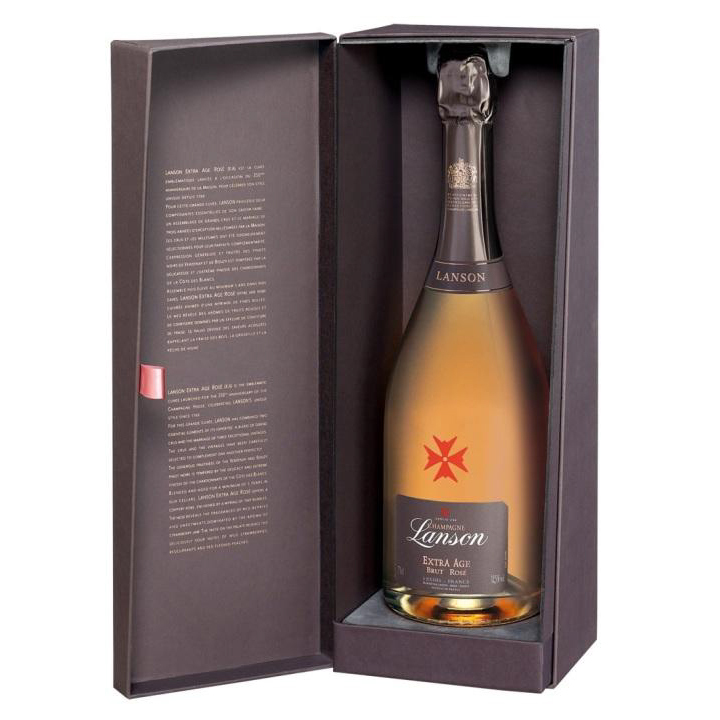 Lanson Extra Age Brut Rosé An extraordinary blend of Pinot Noir and Chardonnay from three outstanding vintages – 2002 2004 and 2005 – Lanson Extra Age Brut Rosé combines classic freshness with generous fruitiness in this complex yet graceful champagne. Details Ageing: Approximately 5 years Blend: 35 Chardonnay 65 Pinot Noir Crus: The Pinot Noirs are selected from the fi nest areas of Verzenay and Bouzy the Chardonnays from Côte des Blancs: Avize Chouilly LeMesnil-sur-Oger Oger and Cramant. Format: Available in bottles (75cl) Tasting Notes With delicious freshness presented by wild sour fruits this champagne is the perfect accompaniment to lamb and desserts made with fresh red fruits. To the eye Extra Age Rosé offers a salmon-pink coppery robe enlivened by a myriad of fi ne bubbles. Fragrances of red berries and sweet meats on the nose are dominated by the aroma of strawberry jam. On the palate it is intense generous and powerful with exceptional complexity and freshness.